Training Programs Now Available on iPods! This morning I jogged 4 miles using SOLE Custom Footbeds. My heel discomfort was hardly noticeable (meaning it was still there). I stretched my foot out for about 5 minutes before and a few minutes after. 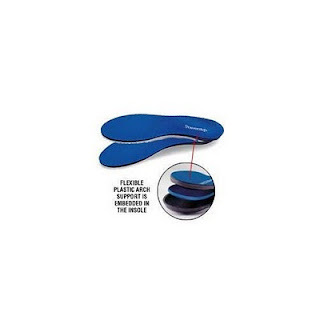 SOLE inserts are heated then molded to fit your feet. I've been walking in mine daily but have decided I need them for running- they are just not as comfortable as Superfeet but for now I need the added support. Here is a nice comparison of all SOLE Footbeds. Note the DK+ version is even Nike+ iPod compatible! Heel Pain Update- Run or Lay-Off? Two weeks I "ran" 30 very easy miles without too much trouble. Last Sunday I decided to test my heel a little and pushed it to 7 miles in 2 runs. On Wed I replaced the usual jog with 20 minutes of almost normal pace x 100 meters, jogging back and going again. While I ran pain free, both of those workouts seemed to flare up my heel pain more than usual later in the day. Today is Sat and my foot is feeling OK so I did a slow 5 miles on frozen dirt, taking nearly an hour. I didn't notice any discomfort at all until I was 4 miles in. I've come to the conclusion that to beat this I need to be more focused on treatments such as ice and stretching. I'm staying away from the jump rope (any ballistic trauma like that is not a good idea) and anything fast. I'm also ordering some different inserts (Powerstep Original). I've been using Superfeet, but I am becoming more convinced that I need additional cushion and slight elevation to relieve stress on a heel spur (I had an x-ray on my left foot in 2002- rereading that radiology report revealed "a prominent plantar calcaneal spur."). I've had no recent symptoms in the left, but suspect I may have that same condition on my right foot as well. Recently I inserted some slim heel pads with the Superfeet, and while it may be my imagination, I think I've noticed a difference. I'm icing, stretching, and have quit rolling the golf ball under the sore spot. I'll also refrain from any runs beyond 4 miles. Call me stupid, but I'm determined to beat this without a total layoff from running. Haile Gebrselassie Running in Dubai on Friday! Dathan Ritzenhein has a Blog! A friend of mine sent me a link to Dathan Ritzenhein' blog (dathanritzenhein.competitor.com). Ritz, who DID run for Colorado and is the American record holder at 5,000 meters, provides some candid insight into some (but not all) of his training "secrets". Looks like a ton of talent and the ability to handle a tremendous workload. The secret may be in how he recovers and remain relatively injury free! Like Lance Armstrong, it looks like Dathan has some interest in triathlons after his running career (future triathlete). According to Dathan's new website ritzrunning.com, his next race is the US Cross Country Championships in Spokane Feb 13. I wish I still lived in Washington! Brett Gotcher Ran for Stanford - Not Colorado! A reader just pointed out to me that Gotcher ran for Stanford as a teammate of Ryan Hall, not Colorado. Always check your facts! Here is a good interview with Gotcher posted a year ago in Runners World. Something tells me his 2:10 will get him some kind of a contract if he doesn't have one already! Congratulations to Brett and McMillan elite! Competitor.com is a nice resource for endurance athletes looking for training advice including an injury prevention piece called Monday Minute by Eric Cressey, a series short video clips that demonstrate supplemetal exercises you may not be familiar with. Six under 2:10! 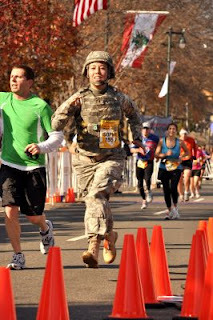 Chevron Houston Marathon is gaining respect around the world as a fast, top-flight race! Jeff Van Gundy finished in 4:14:29 after hitting the half in 1:59:42! I can't wait to see his next NBA telecast. Former Colorado Buffalo runner Brett Gotcher (McMillan Elite) debuts in 2:10:36 for 7th! Nike runner Shalane Flanagan, a bronze medalist in the 10,000 in Beijing now training under former Wisconsin Badger coach Jerry Schumacher, wins her half marathon debut in 1:09:41! What a confidence boost after a sub-par 2009. Former Minnesota Gopher runner Antonio Vega, who now runs for Team USA Minnesota wins the half marathon in 1:01:54! Vega's teammate in Minnesota, and former Notre Dame running Patrick Smyth (Smyth recently won the Midnight Run in New York on New Years Eve - 4 miles in 18:35) finished 2nd in the Half, just 7 seconds behind Vega! It's great to see young Americans like these guys running faster! Instant credibility for Team USA Minnesota and coach Dennis Barker! Teyba Erkesso, another Ethiopian, defended her woman's title winning in 2:23:53. The UWSP Track & Field Team will host its 1st Annual Run-a-Thon on Janaury 20th at 3:00 Pm in an effort to raise funds for its operating budget. For the first time in 5 years ??? Coach Witt will attempt to RUN. This will be my 1st attempt since having total hip replacement. I would really appreciate any support that you can give me. Hopefully I won't need any money to replace the replaced hip. So heres how it works: You pledge and I try to run. I will attempt to run 25 laps on the indoor track. You can pledge what ever you would like per lap. Be part of history as I attempt to make my running come-back. Yes I am a lot older than Brett Farve. Help our team to have its most successful year yet. MY COMMENT: I've got a cold-no fever but I am really stuffed up. Headed out for a slow run, then into Camp Humphreys to toast in the Super Gym sauna! Long-term physical activity has an anti-ageing effect at the cellular level, a German study suggests. Researchers focused on telomeres, the protective caps on the chromosomes that keep a cell's DNA stable but shorten with age. MY COMMENT: Intuitively, we all know this, but now we are beginning to find out why. MY COMMENT: I wouldn't throw away your shoes just yet. It will be interesting to see how the shoe companies respond, if at all. MY COMMENT: I don't think I want to try this. How heavy is a "full battle rattle?" I guess if Oprah can do it, Bertinelli can. She's dropped at least 40 pounds on Jenny Craig. Jeff Van Gundy announced during an NBA game yesterday that he is training for the Chevron Houston Marathon and has in fact done 20 miles in training (the race is Jan 17). If you don't know he is, Van Gundy is a former the coach of the Houston Rockets currently working as a broadcaster for TNT NBA games. I can't wait to see how he does and what he has to say after! I swim with these once a week- they require a little more effort on the pull through! Heel pain is still lingering but no worse. I didn't record it this week but most of the time I jump rope for 7-10 minutes before swimming. Back in 1996, a team of Japanese researchers led by Izumi Tabata published a study comparing moderately intense training (60 minutes of cycling at 70% VO2 max) to intermittent high intensity training (7-8 sets of 20 seconds at 170% V02 max with only 10 sec recovery). Subjects trained 5 days per week for 6 weeks. The results? The first group improved their V02 max from an average of 53 ml/kg to 58 ml/kg. Anaeobic capacity did not improve. The high intensity interval group bettered their V02 by 7 ml/kg, and perhaps not surprisingly their anaerobic capacity increased by an astounding 28%! Effects of moderate-intensity endurance and high-intensity intermittent training on anaerobic capacity and VO2max. According to What Are Tabata Sprints?, this single study "spawned a specific training method: the Tabata. Quite simple and effective, a Tabata session consists of twenty seconds of maximum output, followed by ten seconds of rest, repeated eight times without pause for a total of four minutes. Any exercise will work (running, cycling, burpees, jump rope, squats, etc.) Doing Tabata sprints is perhaps the most rewarding – and physically taxing – way to spend those four minutes. I'm not sure Arthur Lydiard would approve, especially when you are in a base-building phase of training, however once you are fit this might be something you could add to boost your anaerobic fitness- perhaps on a bike. Impressive results for just a 4 minute workout! Pat Porter made 2 US Olympic teams, and won the US XC Nationals an incredible 8 consecutive years in a row (1982-89). Craig Virgin, who ran 8:40 for 2 miles in high school, won the World Cross Country title in 1980 and 1981. I found it interesting that Porter followed up his long run with 800 intervals the next day. I've always found it very difficult to run hard the day after a long one, but for him I guess it was nothing more than long recovery. 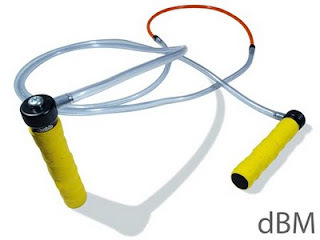 Very comprehensive site including everything you ever wanted to know about jumping rope as a workout. Thanks Frank! You should also check out his inventory of jump ropes- you'll need a good one once you get serious. See the complete top 100 list at USA Track and Field. Before you take a peak, see if you can guess how many times Americans have dipped under 2:10 and the 100th best time. so runners' bodies tell them when they are sharpening correctly. ◙ During the speed-training sessions, the body no longer needs to be forced through the session. Rather the body "surges forward at its own will" and "thirsts to accelerate." ◙ In the hour following training, the runner feels supreme vigor, quite unlike the normal post-exercise feelings of mild fatigue. ◙ Everyday physical activities, such as climbing stairs, become easier. ◙ The runner becomes increasingly sensitive to everyday situations and is mildly irritable as the body is "prepared for action and is ready for the fight." ◙ As the body becomes flooded with previously latent energy, a heightened sexual awareness is often evident. 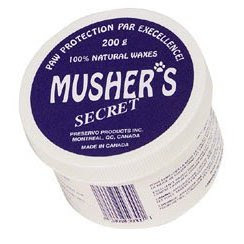 Be Kind to Your Dog- Order Musher's Secret Paw Protector Wax! In the winter, Sumo sometimes has trouble with ice and snow sticking in between his toes- no more! I've ordered Musher's Wax- a must for dogs who run in the winter!